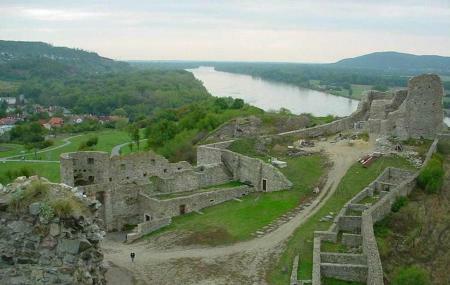 Located at the confluence of the Danube and the Morava rivers, the Devin Castle dates back to the pre-historic era. Known for proving as a strong structure for the city’s defense mechanism from the early 1st century right up to 1809 when Napoleon’s army destroyed the Castle, today, the place serves as an icon for Bratislava’s intense war history. Exhibition rooms in the castle where you can see seasonal displays of the city’s history. Monday – Sunday: Last visit at 3.30 pm. Entry into the castle area only under appropriate weather conditions. Tuesday - Sunday: Last visit at 4.30 pm. Tuesday - Sunday: Last visit at 5.30 pm. Saturday – Sunday: Last visit at 6.30 pm. How popular is Devin Castle? People normally club together Michael's Gate and UFO Observation Deck while planning their visit to Devin Castle. I loved visiting Devin castle. The location is not too far from the city and affords stunning views across Devin and the mountain ranges. A beautiful area with great history of the ruined castle. A must see!! Lots of photo opportunities, beautiful scenery and very cheap. Not too strenuous to walk around, beautiful views over the Danube and quiet in low season. Great view of Bratislava and the Danube river. Even though only the ruins of the castle remain, it's better than Bratislava castle. Worth the trip, ~30min by bus from the city centre, entrance fee 2€. Quite windy in winter as it is on top of a hill. Stunning ruin castle located near the Slovakia/Austria border. A 25min bus ride from Bratislava old town, this place contains great photo opportunities and plenty of areas to relax and view the evening sunset. Entry fee is €5 for adults and €2.50 for students. Bathroom facilities are conveniently located inside the ruins too. Very easy access by car. Big parking lot. At least in April no issue at all to find parking space. the attraction is worth to see. The views are spectacular. The upper castle is closed for upgrading works when I was there so didn't went up. But it a short bus ride from the center (20 minutes or so), and 2 euro to get in. Would recommend going into the castle and then walk around the river after. The main castle itself can be quite pleasure to be around and just walking and enjoying the overview of the area is quite exhilarating. Photos are from the inside of the castle.